With the river continuing to fall, albeit slowly, hopes were high for my morning trip to the river yesterday. It was a perfect height at 1.35m to fish the fly without any weed issues. I tackled up with a 13# 8 weight and a medium sinking head on the multi tip line. The fly of choice was a small Snaelda tube with a tungsten cone head. Amazingly as I lifted off to re cast after my first cast a fish swirled at my feet. 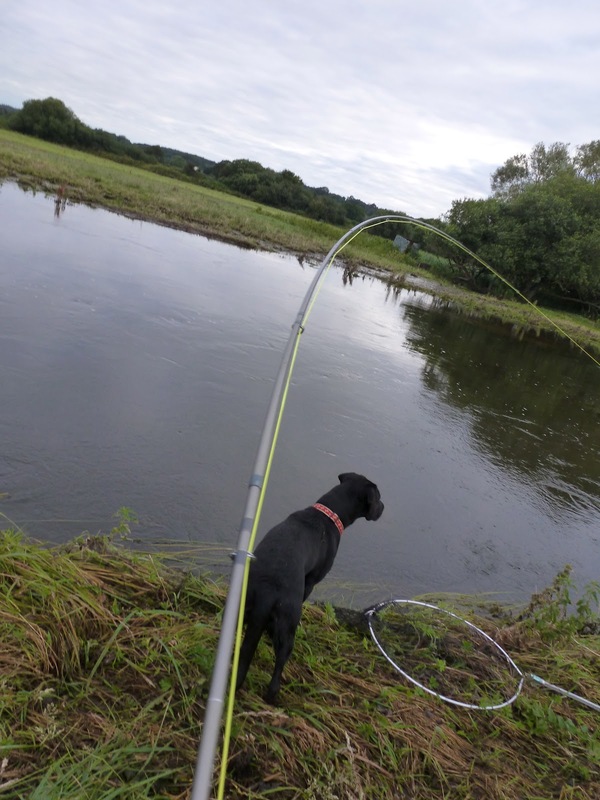 I covered the spot again and it was taken by a small but very fresh Sea Trout. A good start to the day and it was just gone six am. As I worked my way down river i approached the spot where we expect to find a Sea Trout or two. I was not to be disappointed, as the fly swung over the pool tail it stopped, then the fish took off and launched itself high in the air shaking its head frantically, it looked like a nice fish. After a few minutes of tearing around and more airborne antics i managed to land a nice Sea Trout of about 4 1/2 lb. After releasing the fish i worked over the pool tail again but there were no further offers. I worked down to the next pool where I would expect to find a fish. There is an overhanging willow on the inside of the bend with a very deep but small pocket underneath it. It always looks fishy but I haven't seen a fish in there for a couple of years. As I swung my fly across the pool I thought "if I get a decent fish here I've had it" then Bang! The fly line was ripped of the reel before I even realised I was 'in'. I tried to check the run but burnt my hand on the reel. Once the fish slowed down i tightened the drag. As my passage to follow the fish was blocked by the willow I proceeded to 'walk' the fish back upstream where I had a better chance of landing it. At this point Poppy who had had her fair share of excitement already was looking really excited. Because of the sheer power and weight of the fish and the lack of aerobatics I assumed it was a Salmon. Once in the main run above the pool I got to see the fish briefly and realised it was a large Sea Trout. After a couple more high octane runs runs and much charging around the pool I finally managed to net a stunning Sea Trout. My I'm not sure of the wight but it was my personal best and at a guess I imagine it was approaching the magical 10lb Mark. I put it in my diary as 9lb. I continued to fish my way down stream and had numerous tugs and swirls but nothing solid until I got to a nice, usually shallow gravelly run. This run was about 4' deep and looked perfect. There are a couple of small holes in here usually so I had high hopes of finding a fish here at this height of water. as I reached the bottom of the run I knew I was about to cover a small hole on the inside bank and I was was full of anticipation. As the fly swung over the hole the line tightened and I felt the fish fish shaking it's head as it realised something wasn't right. the fish then took off across the run at what seemed like a steady pace as the line pulled of the reel. There was a big flash as the Salmon shook its head and the line went slack! I was gutted, that really would have been the icing on the cake. I fished down a little further then Tony arrived so after a quick bit of breakfast in the hut we tackled up with spinning rods. I only had about an hour to spare and wanted to cover the rest of the water quickly and try those deep holes I couldn't cover with the fly. We had a small Sea Trout apiece and then I had to leave to get to work. As the river was in such good ply I was gutted to gave to leave but was sure Tony would have a good day. Whilst stuck at work I saw i had a missed call from Tony and a text with a picture of a lovely deep hen fish of 34" a cracking fish! It gave a very good account of itself and made Tony's day, I think he left the river a happy man! As the river continues to drop slowly the condition will be great on Sunday when I will return armed with fly rod and high hopes!